This isn’t a proper biography or eulogy. For that, click here. When I found out today that Peelie had died, I couldn’t believe it. I still can’t, to be honest. It just feels a bit unreal. Like one of the terrible sick jokes after Christopher Reeve died. I keep waiting for the unfunny punchline so I can fake a smile. But it hasn’t come yet. When I talked about his death with my wife, she wondered what it would be like if you did an ‘It’s A Wonderful Life‘ with Peel. If John Peel had never been born, imagine all the bands who wouldn’t have been played on radio. There is no other DJ I know of who’s had such an enormous impact on popular music as Peelie. Imagine a pop music world without T.Rex or Joy Division or The Fall or The Human League or… well, you see my point. Peel always pushed his audience, he forced people to listen to genres they wouldn’t normally seek out, whether that was hip hop or grindcore. If you were a regular Peel listener, you expected not to enjoy at least a couple of songs in each program but that’s precisely why you listened. In these days of tabloid DJing, where the audience is just given repetitive lashings of what they slaver for, that kind of musical exploration and education is dead. British radio is now nearly as genre-bound and cackly niche-marketed as US radio. Indie kids just listen to indie shows, hip hop fans listen to hip hop shows, every genre is separated and equally poorly served. Only on a maverick show like Peel’s did you ever witness their joyful, confused collision. I’ve been ripping-off Peel for years, since I first started getting paid for DJing. I’ve never had as impeccable or wide tastes as he had but I’ve always tried not to play just the one genre of music. I loved Peel for the light and shade, for the fact you could have Carcass and Bis rubbing shoulders. Or Bolt Thrower and Bobby Lewis. John Peel made me feel less of a freak. Whether that was in 1979 when I first tuned into his welcoming voice or years later when I was depressed and wondering if I’d ever get my songs played on the radio. Well, in 1991, Peel played a song of mine on his show. It was my first ever airplay on Radio One. Instantly, I got letters from his listeners around Europe and from loads of fanzine writers. It made a difference to me, just to have that little bit of airtime, that 3 minutes on The John Peel Show. Eventually, because of a fanzine address Peel read out one night, a fanzine that featured me, I met the girl I’m married to now. The tiniest of actions has consequences that spread out like ripples on a pond. Just think about how many people those ripples reached out and changed. For a lot of music-obsessed kids like me, the freaks and the geeks, John Peel was our saviour. We’re the ones who are passionate about music, we get bored with the charts so we look a little further. We may not be good-looking or get picked for football but we’ve always had the music. We’re the fat kid in school or the girl who’s too shy to speak or the gay lad in a fistfight, we’re the people who end up forming bands and making records. And in Peel we always had a supercool older brother who’d play us a great new band we’d not heard of yet, even if it was sometimes at the wrong speed. He had that closeness: I always felt like he was playing stuff just for me. Silly, isn’t it? That’s a life fully lived. To have weaved yourself, as Peel did, into the hopes and dreams of so many people, to have joined them together with strange, new music they would never have heard otherwise. To have given so much to an entire culture as Peel did, faithfully serving his listeners despite being shoved all round the schedules by an un-caring, increasingly Thatcherite (as opposed to Reithian) BBC. Now, that’s a real hero. Tonight in Scream, the DJs put on ‘Teenage Kicks.’ The dancefloor quickly filled and after it finished there was a completely impromptu round of applause and shouts of ‘John Peel! 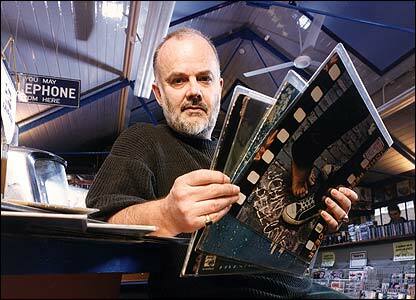 John Peel!’ It was a fitting mark of respect at the passing of one of the greatest champions of new music. My thoughts go out to his wife and family.